Registration for Girls Rock Camp 2019 is officially open! More information about registration follows below. For general information about what happens at Girls Rock Camp, visit our Girls Rock Camp info page and last year’s camp blog. Click on the buttons below for the online application forms. Please note: If your camper is not with you when you complete your registration, you may still submit the form. The camper’s section (About Music & More!) does not have to be completed to register. A link to this section will be included in your application confirmation email, and the camper may complete it by the May 1 registration deadline (the sooner, the better!). Once you have filled out a camp application, please click the “APPLICATION FEE PAYMENT” button below to pay the $10 application fee safely and securely via PayPal (Please do not pay via Razoo/Mightycause–thanks!). BECOME A GRIT: Are you a Girls Rock Camp alum between the ages of 15-18 (heading into grade 10-12 in fall 2019), who has either a) attended Girls Rock Camp twice or b) attended Girls Rock Camp once and has also attended another GRR! program (such as Group Lessons or Sophia Sings)? You’re in luck– you are qualified to be a GRIT (Girls Rock Camp Internship & Training program participant) at Session One of camp (you can still attend Session Two, as well!)! All qualified applications completed by the deadline will be considered. Learn more about becoming a GRIT and fill out the GRIT application below! Please note: youth who have already participated in the GRIT program in the past are not eligible to apply again this year, in order to give more youth the opportunity. 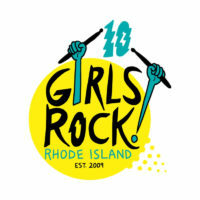 However, GRIT alums can still attend Girls Rock Camp Session 2 as campers and be a part of our VIT (Volunteer-in-Training program– contact Denise at denise@girlsrockri.org for more info about becoming a VIT)! Registration will open February 23 at 9am and closes on May 1 or when each camp has reached capacity. SESSION 2: August 12-17 for campers ages 14-17 (in or entering high school, 9th-12th grade) at JamStage, capacity of 30; current, former, and future GRITs and VITs are encouraged to apply! Please note: Campers are expected to attend camp every day and fully participate in the program. The bands work as a team throughout the week to write a song together, so it is important that campers attend camp every day. Session 1 will be held at Rhode Island Philharmonic’s Carter Center, located at 667 Waterman Ave in East Providence, RI, which is right off of a bus line. Session 2 of Girls Rock Camp will be held at JamStage, located at 25 Esten Ave in Pawtucket, RI, also right off of a bus line. Tuition for the week is $395 plus a $10 application fee. Please note, application fees and tuition are not considered donations, and therefore are not tax deductible. If you would like to sponsor another camper who cannot afford full tuition you can separately make a donation to our scholarship fund here. Yes. We offer reduced tuition on a sliding scale based on the participant’s household income. What is reduced tuition and sliding scale? We offer two types of reduced tuition: Partial Scholarship and Full Scholarship. These will be awarded by GRR! staff and are based on household income and the amount a family is able to pay. Families awarded a Partial Scholarship for reduced tuition will pay what they can between $50 and $250 (also known as sliding scale; families determine the amount they pay based on what they can afford). Families awarded Full Scholarship reduced tuition will attend for free. Contact rachel@girlsrockri.org for more information. How many reduced tuition spots are available? Space at Session 1 is limited to 50 participants and we will award approximately 16 Full Pay spots, 16 Partial Scholarship spots, and 16 Full Scholarship spots. Space at Session 2 is limited to 30 participants and we will award approximately 10 Full Pay spots, 10 Partial Scholarship spots, and 10 Full Scholarship spots. Once you have received final confirmation that your camper has been accepted into camp, payment is due by May 15 for early acceptance or June 1 for the second round of acceptance letters. If you do not pay in full by the deadline we will be forced to cancel your acceptance into the camp and give your spot to another camper. Full pay tuition is $395. If you are receiving a partial scholarship, tuition is sliding scale (pay what you can) between $50-$250. You will be able to pay on this page via Paypal or via check once we contact you to let you know your camper is on the final camper list. We do our best to help everyone get their first choice instrument, but that is not always possible, and sometimes campers will have to play their second choice instrument as a way to make cohesive bands. If you apply online we will email you a notification that your registration has been received within one week of the date of your registration. We will also mail out notifications to every applicant to inform you of the status of your acceptance. Registration closes on May 1 and the final list of campers will go out by May 18. If you need to cancel, please notify the office right away. If you have submitted your payment and would like a refund, you must cancel IN WRITING. If you cancel before June 15 we will refund 50% of your payment. If you cancel after June 15 we cannot refund your payment. Also, full payment is due by June 1. If you have not paid in full by this date, you will lose your spot, as there are many other rockers who’d be happy to have it! If you didn’t get into this session we will keep a short waitlist in case there are any last minute cancellations. This list is only active for this year’s sessions and you will have to re-register next year. Do you only play “rock” music at Girls Rock Camp? No! We use “rock” as a verb, as in we like to “rock out” on all kinds of music! Our campers listen to and play a wide range of music genres, from rock to hip-hop, jazz to folk, pop to punk. Our volunteer instructors and band coaches support campers in finding their own voices and creating the kind of music that they are most passionate about. Do I have to have musical experience? Nope, all skill levels are welcomed! camp is a wonderful opportunity to try new things and learn from each other. Is the Girls Rock! RI camp only open to girls? The GRR! camp is open to girls, trans and nonbinary youth. Our mission is to provide an affirming space that supports your identity. Girls Rock! Rhode Island is a fully-insured day camp in Rhode Island. All of our camp week volunteers undergo the standard, up-to-date background checks required of anyone working with children in Rhode Island. Girls Rock! Rhode Island also provides up to 30 min. of morning & afternoon supervision for campers who cannot be dropped off or picked up right as the camp day begins & ends. Contact Denise with any questions about registration: denise@girlsrockri.org!